The Greatest Debate Performance in the History of the World! I don’t really begrudge conservatives their victory lap today. This campaign has been a grim one for them, with a candidate they don’t like much making gaffe after gaffe and now trailing a president they loathe in virtually every swing state. Romney’s debate win last night is a rare ray of sunshine for them, and it’s no surprise they’re making the most of it. 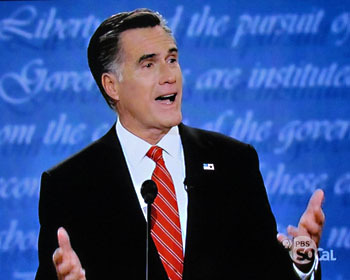 Romney’s was the best performance of any presidential candidate in the television age. Better than the Gipper? Say it ain’t so! And why only the television age? I guess so that Kirsanow isn’t claiming that Romney was better than Lincoln. Or something. I’m not quite sure. In any case, these guys need to watch out. The way they’re crowing about Mitt’s world historical performance, he’s going to have to show up with a halo over his head to meet expectations in the next debate.